If you’re in Chiang Mai, you might find at the Chiang Mai Gate the food stalls located on the south side of the Old City’s square moat. The Chiang Mai Gate food stalls come to life around 5-10 pm everyday, and I'll be taking you there! Let's go! 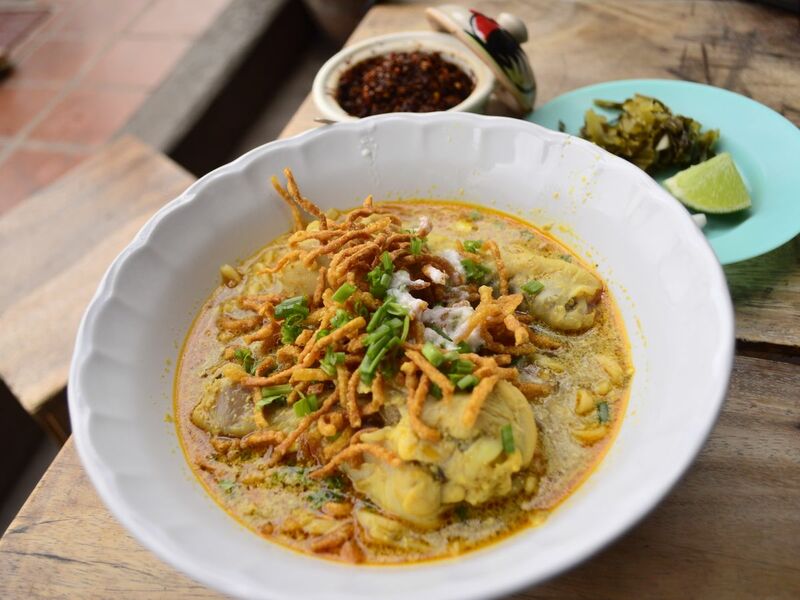 Let's start by drinking a fruit smoothie of fresh seasonal fruits + enjoy a northern Thai curry dish (Khao soi – A northern specialty, a creamy, spicy coconut curry with yellow egg noodles.) + Papaya Salad, Grilled Chicken Skewers, & sticky rice! After dinner, we'll walk to Tha Pae Gate along the moat and sightseeing around the area and we'll walk through Ratchadamnoen Road until the end of the road at Wat Phra Singh Temple! This is when the trip ends, and I'll send you back to the hotel! Thank you for joining me ! Vipavee was the perfect guide, a charming young lady who was very informative with a great sense of humour. We could not have asked for more. Vipavee made our Chiang Mai vacation fun and full of wonderful memories. We highly recommend her tour. We had some delicious food and went to street vendors and a restaurant we would had never discovered. Vipavee is highly professional and friendly. She cares about her craft and took every step to ensure our tour was going to be a great one!